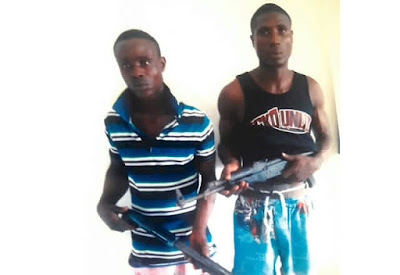 The police in Bayelsa State alongside operatives of the National Drug Law Enforcement Agency have arrested two suspected armed robbers in the state. The Police Public Relations Officer, Bayelsa State Command, Mr. Asinim Butswat , said the suspects were apprehended during a joint patrol along the state ’s section of the East- West Road. Butswat, a Deputy Superintendent of Police , in a statement on Thursday , gave the names of the suspect as Salvation Ebitimi , 29, and Edafe Josiah, 26. He also said that during the operation on Tuesday, December 5, the security operatives recovered an AK 47 rifle with 19 rounds of live . 9mm ammunition , one English made double- barrelled pump action and a handsaw. Butswat noted, “ The synergy among security agencies in Bayelsa State has paid off during a joint motorised patrol along the East -West Road, Bayelsa State. “A team of Narcotics Operatives from the NDLEA intercepted a Toyota Previa bus, along the East- West Road on December 5, 2017 at about 0700hrs. “A diligent search on the occupants led to the arrest of one Salvation Ebitimi, male, 29 years old, from Bolou -Angiama, Patani, Delta State and one Edafe Josiah, male , 26 years old, from Afise Road, Ughelli. The police spokesperson also said that on Wednesday , about 9. 30am, policemen on a routine stop- and-search operation flagged down a motorcycle along Amassoma Road, Yenagoa, the state capital. He said the rider of the motorcycle refused to stop, resulting in a chase by police operatives. He said as the rider was being pursued , they (suspects ) in the process dropped a bag containing 50 live cartridges and escaped . Butswat said the police had intensified to arrest the fleeing suspects.